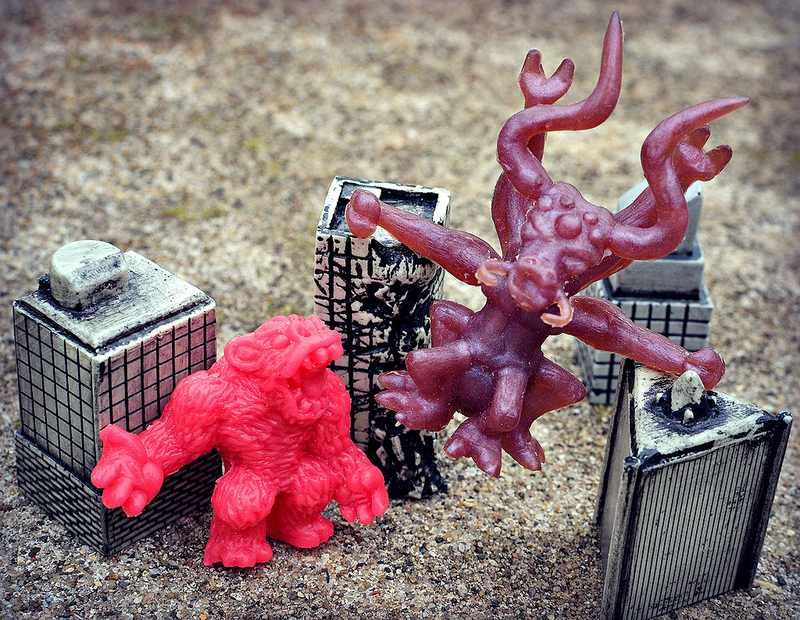 Early this year, Imperfecz Toys and Ironhaus Productions teamed up for a new line of rubber mini monsters called Doom Götter (which I believe translates to Doom Gods). With the second series freshly released this month, I thought it was the perfect time to finally get my hands on some, take some photos and do a write-up. You might remember that Imperfecz and Ironhaus previously collaborated on a couple of other great sets, Mutants and Infestors. The duo continue to outdo themselves--Doom Götter is possibly their best creation yet. Not only are the monster sculpts nicely varied and incredibly well done, but this set raises the game by including a play environment element that makes it extra fun. 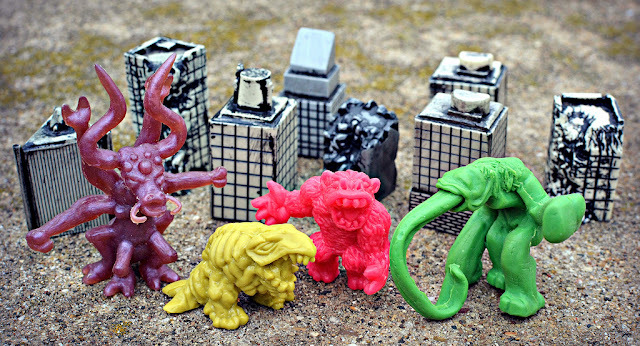 The concept is all different kinds of kaiju fighting and wreaking havoc in a city setting, so each monster comes with battle-damaged resin buildings so you can set up a little display with them. Very cool idea! 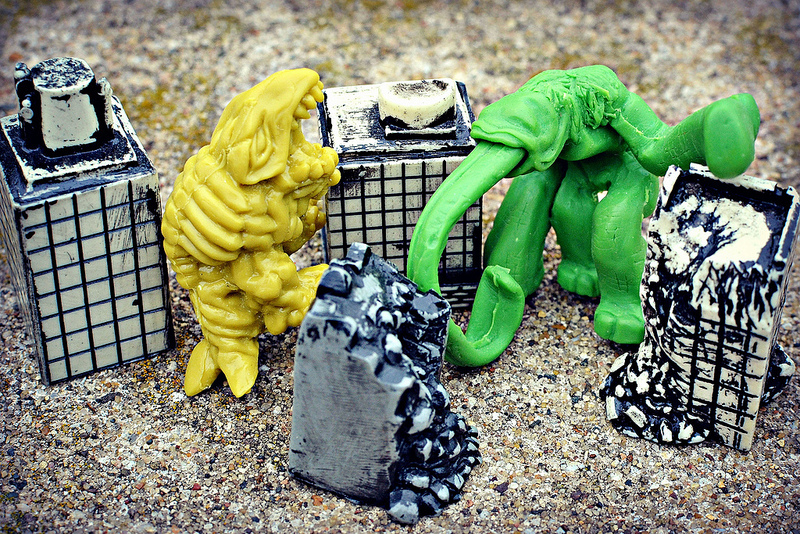 Both of the series so far include two different monsters, so as of now there is a total of four different figures available. 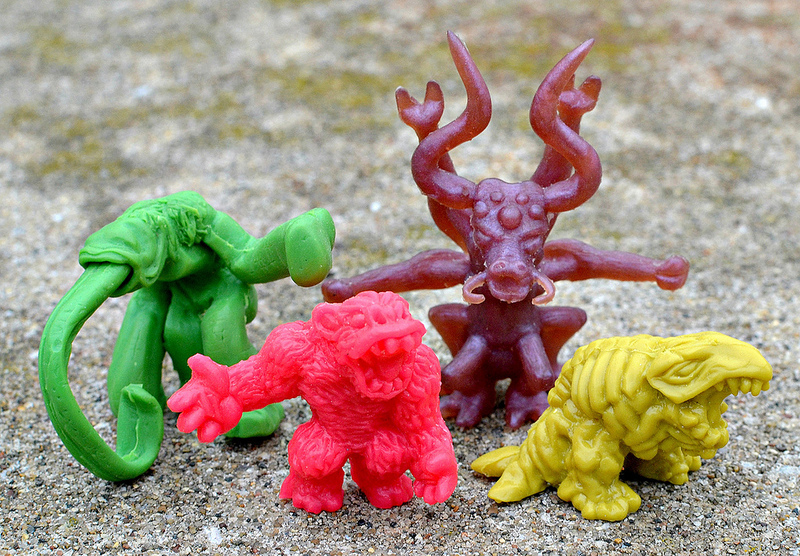 Each monster is sold separately, cast in a soft, flexible rubber and comes packaged as most indie mini figures do--in a little plastic bag with a header card. 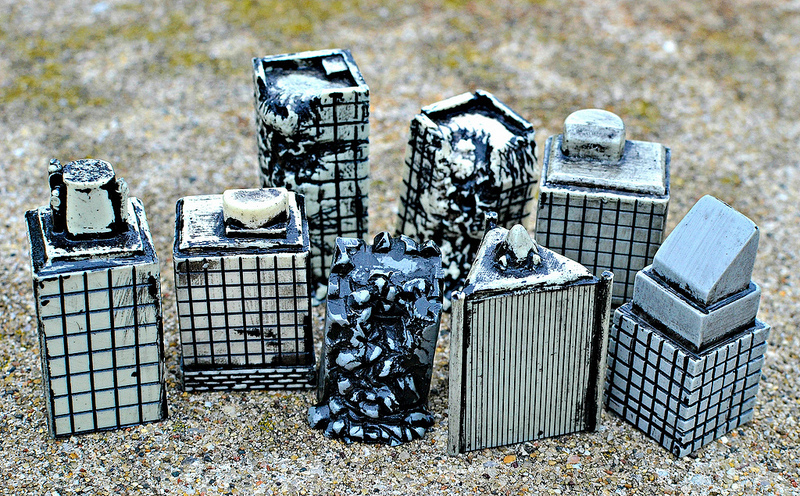 Two buildings come along with every monster, attached in a separate bag. Let's take a closer look at each series. The first set is inspired by Japanese Yokai lore and features Bake-Kujira (sculpted by Ironhaus's Jimmy Rommel) and Akaname (sculpted by Imperfecz's Luke Harris). In Yokai legend, Bake-Kujira is a ghostly skeleton whale. Here, Jimmy expands upon that basic description a bit by adding in a bit of ticked-off dinosaur. The result result is a fierce little monster sculpt with some fantastic texture and detail. Akaname has a smoother sculpt and an eerier vibe to its design. Also known as the "filth licker," in Yokai lore this creature is known for "licking up the grime and dirt that accumulates in unclean bathrooms" (hmm...thanks, Wikipedia). Luke's sculpt makes it look much more bizarre than it does in any of the depictions I saw in Google Images, and I love that. Its gigantic, curled tongue, bulbous arms and muted facial features make for a really creepy little weirdo. Side note: The long tongue and general oddness made me think of a Wol Cabasshite with arms and legs. Now onto the brand new Series 2. This time the theme stretches out from Yokai a bit, with one of the monsters being the infamous cryptid Chupacabra. The other figure, Ushi-Oni, continues down the Yokai path set by Series 1. Chupacabra is a Jimmy Rommel sculpt all the way, in that this little beast looks majorly scrappy, plus simultaneously pissed off and a little giddy about the damage he's about to inflict. Jimmy has a way of packing a lot of personality into his sculpts, and Chupa is a perfect example. Luke's Ushi-Oni is a truly unique figure, and like his Akaname, sports some wonderfully freaky proportions. In Japanese legend, this creature is known as having a horned, bovine head and a spider or crab-like body, and you can definitely see that here. I also get a bit of an ant vibe from Luke's interpretation, which makes it even weirder. 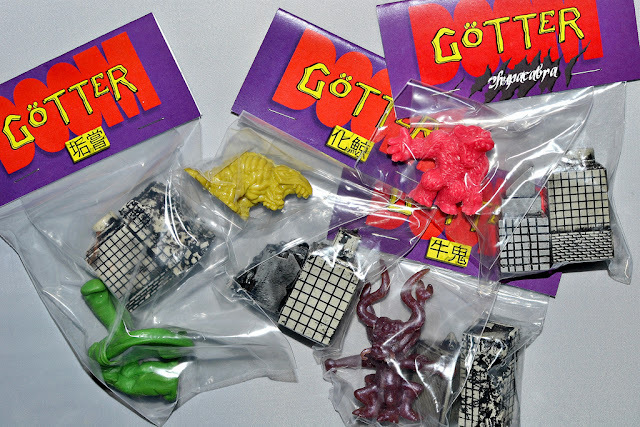 One of my favorite things about Doom Götter is the variety of the monsters, and the different styles Jimmy and Luke bring to these sets make them extra special. I've also got to call out the building accessory pieces because they're pretty damn nifty in their own right. The kaiju are of course the stars of the show, but the buildings really do add a lot to the coolness factor of Doom Götter. Of the eight different ones I got along with the four figures, each is a unique sculpt with nicely-done detailing accentuated by simple black paint apps. It's a lot of fun to set them up with the figures to create a mini battle scene. Doom Götter is a fantastically creative indie toy line, and I really hope Imperfecz and Ironhaus continue to release more figures and buildings so we can build out our displays even further. You can pick up some for yourself in the Imperfecz store. Each figure and building pack is either $10 or $12 plus shipping, and you can also purchase extra packs of buildings in quantities of either five or ten. The figures are available in a variety of colors, and you can even add a paint wash to them to highlight all of the details. Check 'em out! Wow! 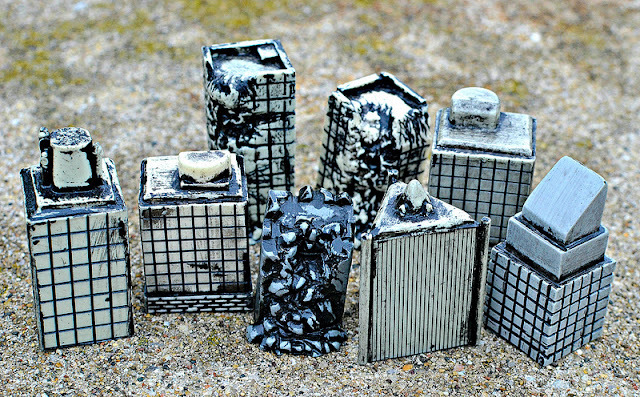 Those buildings really sell the figures! :D Great addition!